The Ventura County Sheriff’s Office concluded a lengthy investigation into two separate gang related shootings that occurred in the City of Fillmore. The first incident involved a suspect who shot two victims as they sat in a parked vehicle in the 800 block of 3rd Street on 12/17/2017. The second incident involved a suspect who shot a victim in the 800 block of 4th Street on 12/24/2018. Through continued collaboration between the Fillmore Police Department, Sheriff’s Gang Unit, Sheriff’s Special Crimes Unit and the Sheriff’s Major Crimes Unit, detectives identified Esteban Reyes as the suspect in both crimes. On 03/12/2019, Reyes was arrested for three counts of 664/187 PC – Attempted Murder and 186.22(a) PC- Street Terrorism. Reyes was in Sheriff’s custody for an unrelated case involving criminal threats and brandishing of a weapon at the time of the arrest. 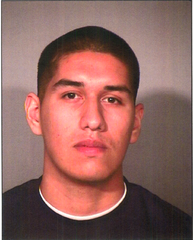 Reyes’ bail has been set at $4,120,00.00 and he is scheduled to appear in Ventura County Superior Court today.